Japan has always been at the top of my travel wishlist. It started at age 10, when I was obsessed with Hello Kitty, and my 10-year-old self pictured the entire country as one giant Sanrio store. When I finally made it to Japan this past October, 15 years later, it wasn’t quite the Sanrio paradise of my dreams, but the fabric stores certainly filled me with childlike delight. I see any trip as an excuse to bring home a suitcase full of fabric, as the archives of this blog will easily attest. But this wasn’t just any trip – this was Japan, home of ubiquitous kawaii. So when I say “suitcase full of fabric”, it’s not hyperbole. My rolling carry-on bag was bulging with nothing but fabric on the flight home. I posted a teaser picture months ago on my Instagram, but haven’t shared more details until now. How cruel of me! Hopefully these were worth the wait. I love them all. This teal fabric with the orange animals is my favorite from the entire haul. The colors are perfect. I bought it as a pre-cut, so it was folded very small, and I couldn’t see many of the details. 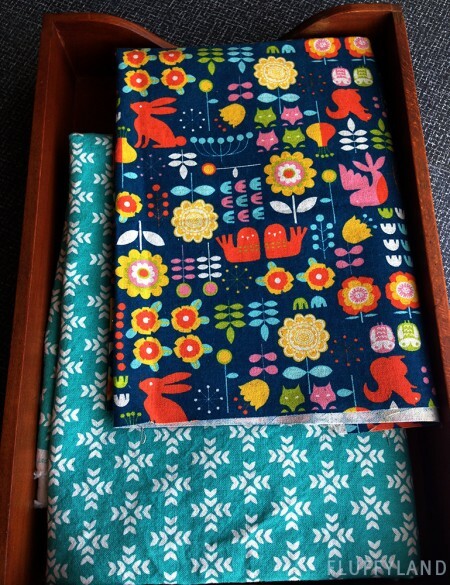 When I unfolded it to lay it in my suitcase, I couldn’t believe all of the funny animals: orange rabbits, squirrels, and of course those darling owls that appear to have seal tails! It was the first fabric of the haul to be cut into: I paired it with a scrap of teal leather (from Belgium!) to make a little wallet. As I combed through the animal-print fabrics at each store, I was always questing for sheep to give to Marie. 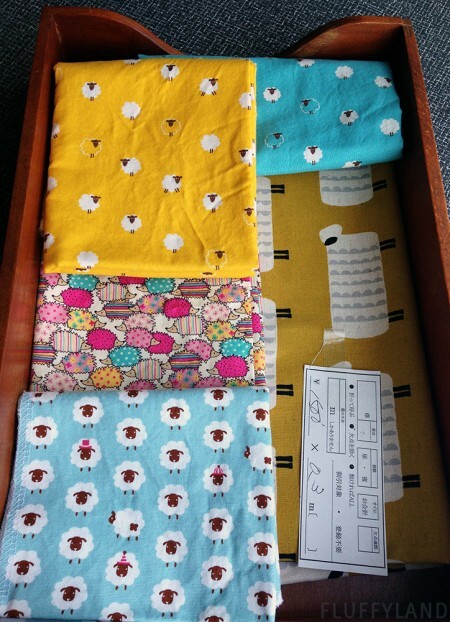 I found tons of sheep fabrics, each one better than the last! I kept a few small cuts for myself, and of course I’m obsessed with the neon rainbow hedgehogs in the photo above. The best part of so many of these fabrics is the random deviation from the standard patterned animal. 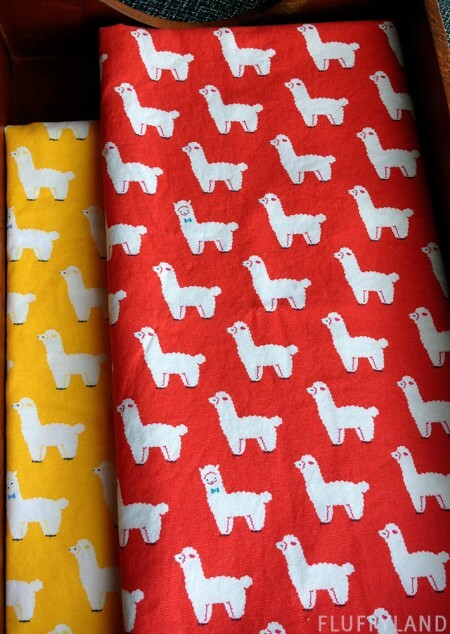 With these alpacas, it’s, “alpaca… alpaca… alpaca… alpaca with bow tie!” It’s a subtle surprise in each one, but it makes them so much more fun. The blue sheep print above also has some great surprise sheep. Panda fabrics were everywhere. It was impossible to pass up the pandas in teacups/driving cars/flying airplanes… and don’t get me started on the donut pandas. And this cow print is fun and subtle, if a bit dizzying. The Minny Muu tiny snails and parakeets were irresistible. And, even better: tiny, tiny VW vans. I even brought Lemon Tree some fabric! I’m working on a pair of napkins made out of the lemon print, and the onions are destined for a pair of tea towels. 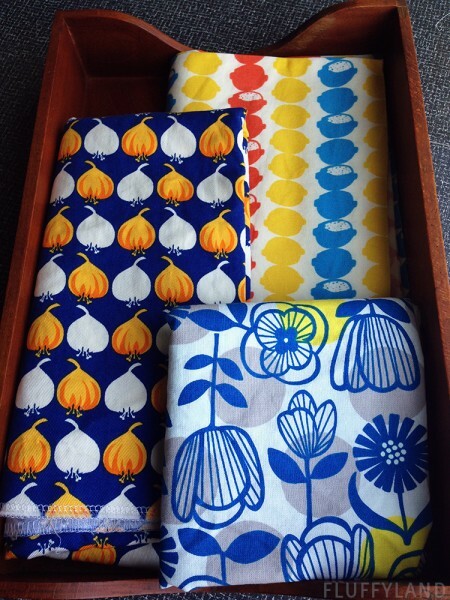 There was also a lot of Scandinavian influence in the fabrics I saw, like this blue print, including some Marimekko lookalikes and lots of fun graphic flowers. 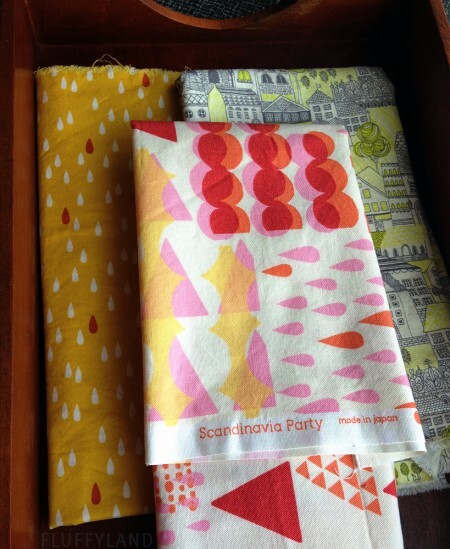 This “Scandinavia Party” was the only block-printed fabric I came home with (it’s a common, and beautiful, fabric-printing style in Japan), and I love it dearly. I might even just hang a section on the wall. I’ve always wanted to add the Lecien tear drop print to my stash, and the green apartment print is destined to become a darling tote bag or purse lining. 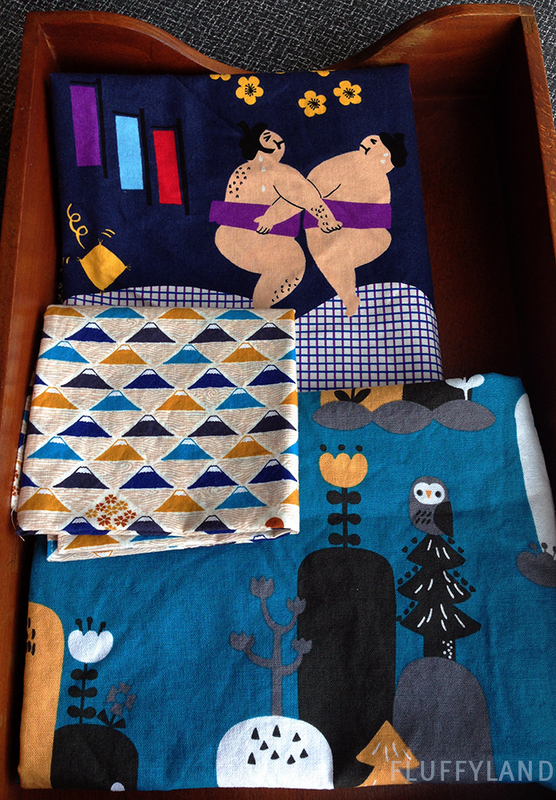 And I couldn’t pass up these fabrics celebrating Japanese culture. The sumo wrestlers are just plain awesome, Mount Fuji is the cutest mountain ever, and the little mountaintop owls are a testament to Japan’s incredibly hilly terrain. 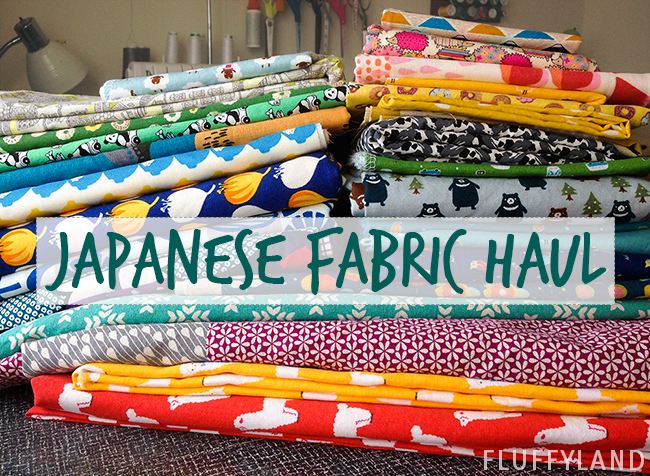 It’ll take me awhile to use up all this fabric, for sure, but luckily I’ve already started cutting into a few. It’s always so hard to cut into fabrics this loved, especially when they can’t be easily replaced! But I figure it will be a long time before I’m back in Japan, so this stash will serve me well. Tomato in the Nippori Textile Town district of Tokyo. All of Nippori was awesome, but Tomato was basically heaven. Tokyo Craft Guide’s Nippori Fabric Town map was very helpful for getting around Nippori. These maps are also available at many of the shops, but it can be hard to find the English map. Take a backpack… all that fabric gets heavy! I love the pandas in the teacups. So adorable. The Miny Muu fabrics are cute too. 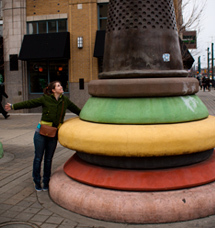 Thanks for sharing the pics from your trip. 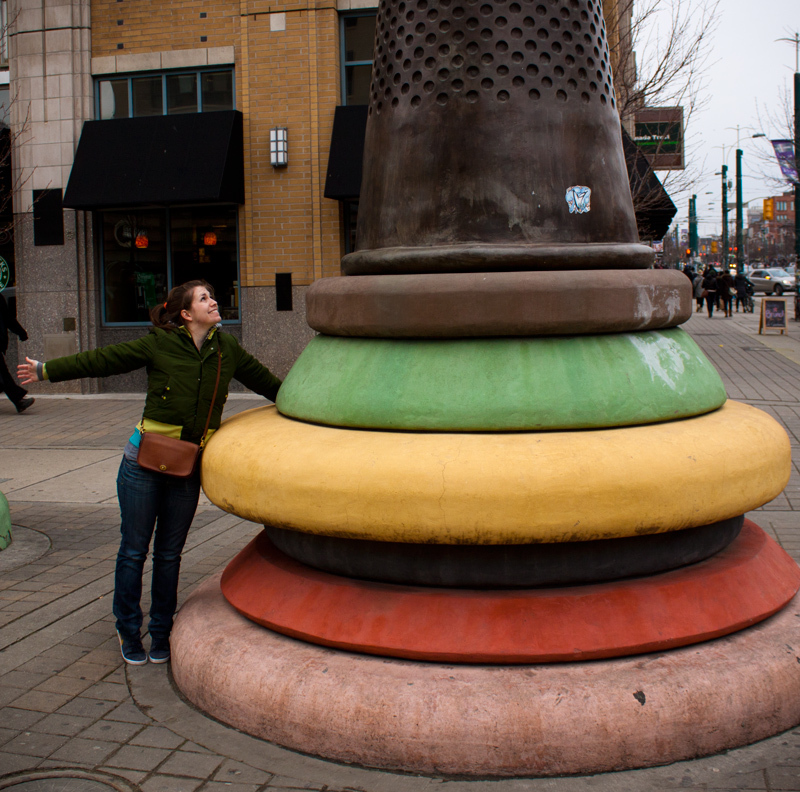 Looking forward to seeing what you make out of these. 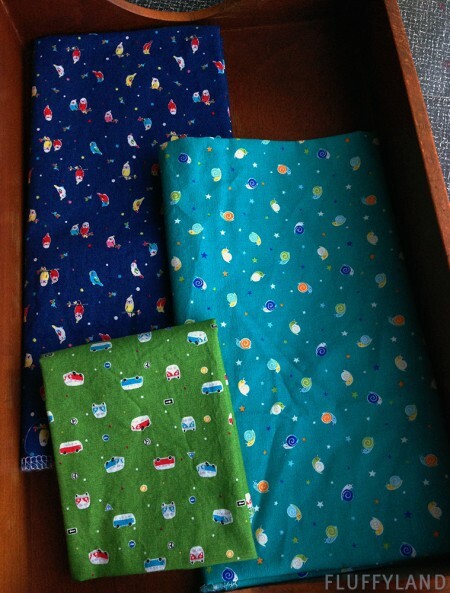 I’ve been in Japan in November and purchased some souvenirs with fabrics. 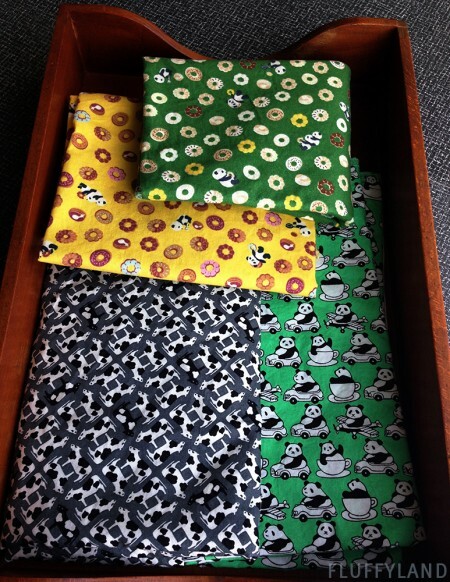 These panda fabrics are very funny and authentic.